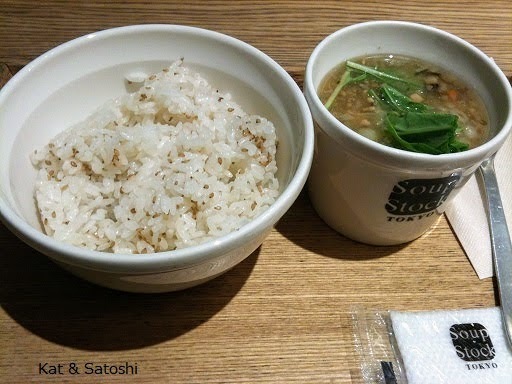 So, I was telling you that I finally got to try Soup Stock Tokyo. For 500 yen, you can have the soup of your choice. And you can choose rice or bread. I chose rice, which came sprinkled with sesame seeds. The rice is on the firmer side, so it goes really well with their soup. The soup I chose was their 7 veggie with ginger soup...really delicious! And, the recipe is in their cookbook, so I hope to try making it soon. Ever since Soup Stock Tokyo opened up in Osaka, there is always a line to get in. Oddly, I bought the Soup Stock Tokyo cookbook even before I tried this place. 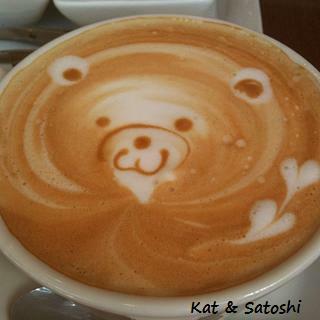 So, on Sunday morning, while I waited for Satoshi to finish his German class, I went to have breakfast there. There was a line, but it wasn't as crazy busy as it usually is at lunch or dinner time. 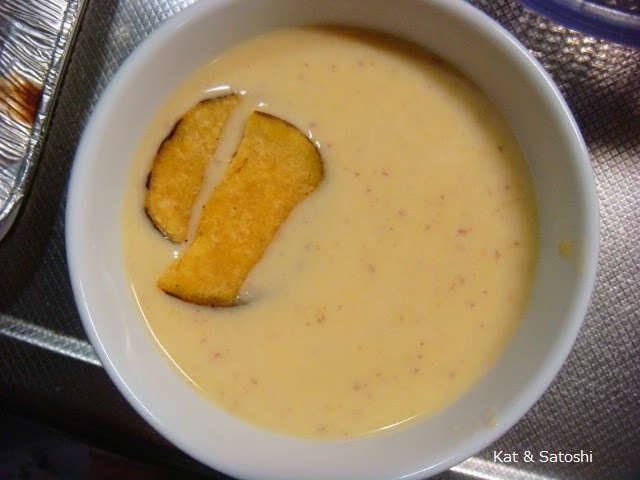 A creamy soup that is so sweet, you'll think the person who made the soup added sugar to it. After washing the potato well, cut the potato into 5-7 millimeter slices. 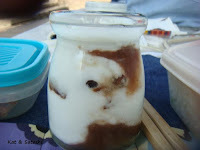 Take everything off the heat and with a hand blender (immersion blender), puree everything. Put everything through a fine strainer. You should have only the skins of the potato left in the strainer. NOTES: I added more water than the 1/2 cup to steam just because I thought the 1/2 cup would be too little. My strainer wasn't too fine so I had some bits of potato skin in the soup, I also didn't fry slices of potato, I bought sweet potato chips. Still, this was an easy and very tasty soup. I'm making this again. 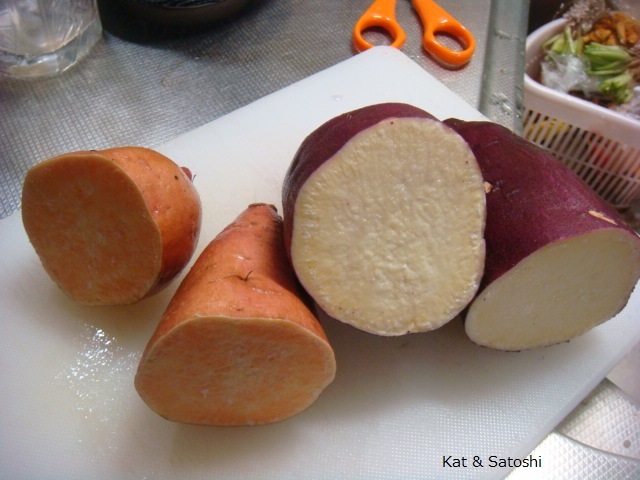 Another veggie that is in season now are sweet potatoes. 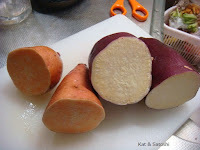 There is a very sweet potato (pardon the pun) called Anno-imo (ahn-know-ee-mow). It is grown on Tanegashima, a tiny island that is part of Kagoshima prefecture. The flesh is orangy but when cooked turns a bright yellow. Here's the recipe if you'd like to try making this. NOTES: I like the sweet-sour combo of this salad. 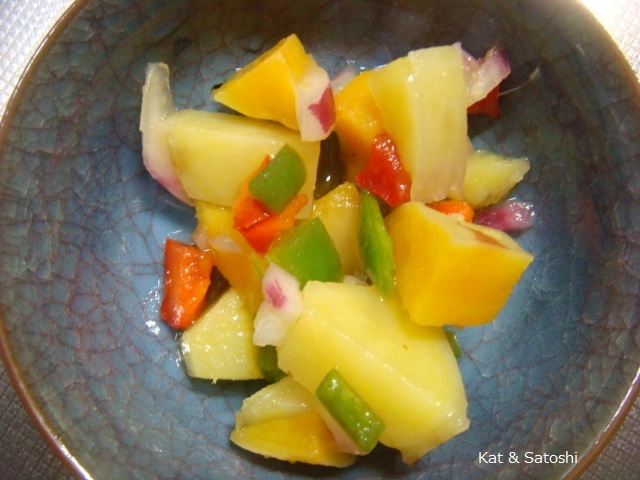 Satoshi had no idea what I had made this salad of and thought it looked like pineapple at first. After taking a bite, he realized it was sweet potato. Another thing that is in season now are pears. When I first saw this pear in the market, I had thought it was a La France. But upon looking closer, I realized it was a different variety. Marguerite de Marillat is a rather old variety that was originally grown by a person named Marillat near Lyon, France in 1872. 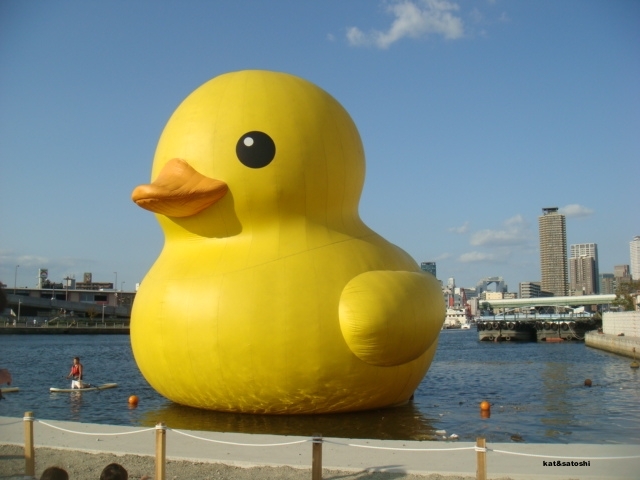 Later, it was grown commercially in the early part of the 20th century in the United Kingdom. The skin is rather tough and a bit sour, but the inside is very juicy and sweet. 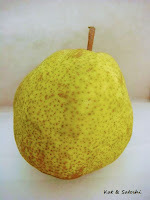 The website that I found information for this pear on, said that this type of pear is usually used for desserts. 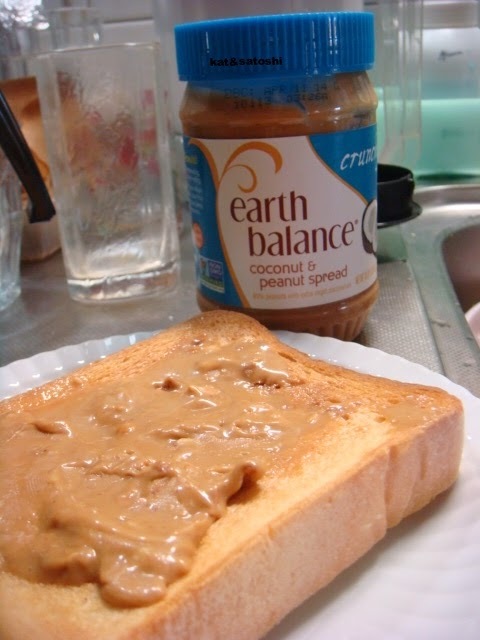 We had this with our breakfast the other day. 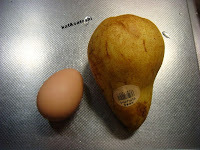 I put it next to an egg to show you just how big it is. This particular pear was grown in the northern part of Japan in a prefecture called Yamagata. I told you that our laptop went to "computer heaven"...well, after we got a "diagnosis" and purchased a new laptop, we went back to talk to the tech support guy. If our old laptop were in better condition, they could've bought it to re-sell, but since it was kaput, he told us about recycling it. On the underside of the laptop is this mark (see the photo). He explained that since it has this mark the maker will take it back to recycle at no additional cost to us. 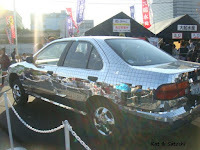 You should know that in Japan, most EVERYTHING costs something to recycle. For our city (Minoo), if the item fits in the proper recycling bags, then it is usually paid for through taxes. 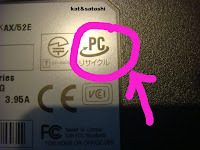 If it doesn't, our city requires us to pay at least 300 yen, up front, for it to be recycled. The bigger the item, the more you pay. So, we're always looking for places that will take things (at no extra charge) to be recycled. Like if you buy a sofa, will the company you are buying from, dispose of your old sofa at no extra charge...things like that. 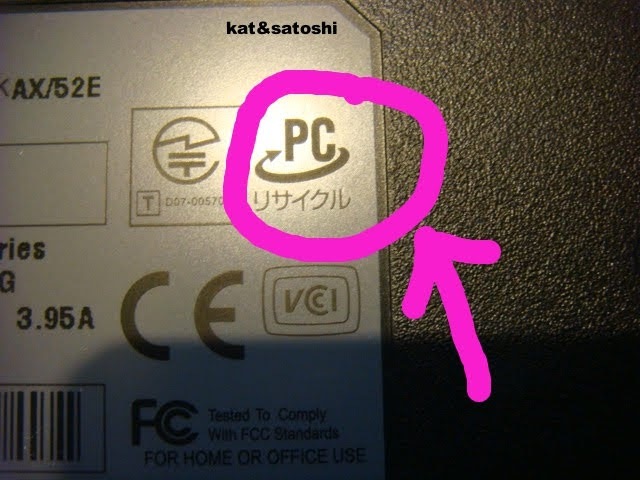 If our computer didn't have this mark, then we would've had to pay about 3000 yen to have it recycled. I like the fact that the maker is going to send me a package to put the laptop into and send it back to themselves at no extra cost to us. Does it cost a lot for you to recycle where you live? 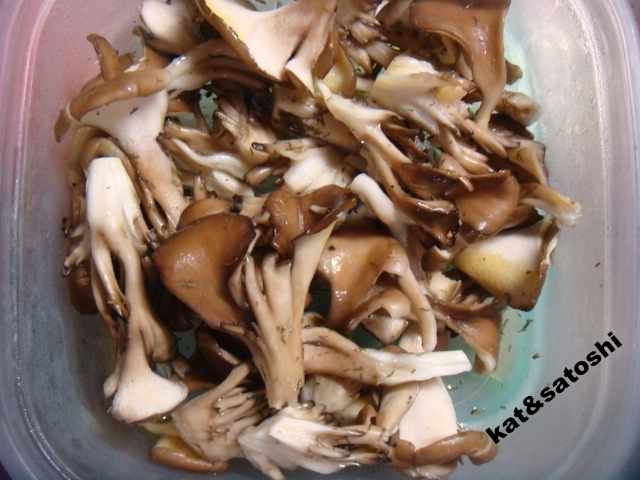 It's kinoko (mushroom) season here, so there are many different types in the market these days. 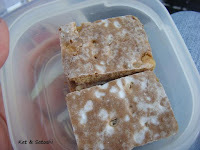 I found this super easy recipe in one of my Mom's cookbooks, "Moosewood Daily Special". Combine everything, coat well and let sit for 15 minutes before chilling. NOTES: I used maitake (hen of the woods). I also used all olive oil. I didn't have cider vinegar so I used white wine vinegar. I also used 1/2 teaspoon of dried dill. I omitted the salt and put in several grinds of black pepper. This was so easy, I'm definitely making this again. 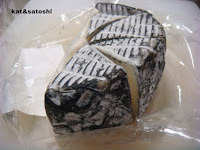 We recently tried this cheese called Carboncino. It is an Italian soft cheese made from the milk from cows, sheep & goats. The outside is coated with an edible vegetable ash. I really liked the creaminess of this cheese. It reminded me of butter. 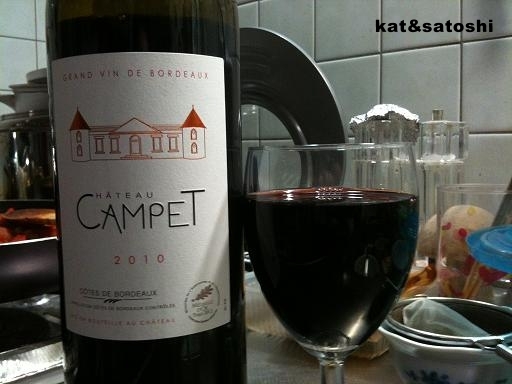 This cheese really went nicely with a glass of Bordeaux by Chateau Campet. It's Friday. 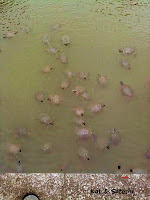 A typhoon is passing by as I type this and we are expecting lots of rain today and tomorrow. Sorry it's been a bit quiet here. Our laptop went kaput and after having it looked at, it was determined that it wasn't worth fixing, so we got a new one. 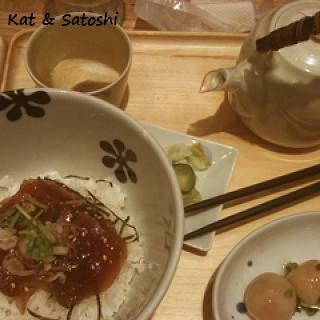 Anyway, I wanted to tell you about a foodie adventure Satoshi and I had last Friday. We went to Shitennoji, in the southern part of Osaka. 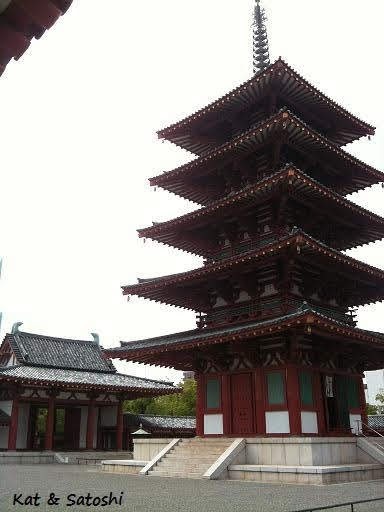 This area was the first state-established Buddhist temple in Japan and was created in 593 by Prince Shotoku. The property is huge! spanning 110,000 square meters (27.18 acres). To see so much land not filled by condos is definitely rare especially in the heart of Osaka. Unfortunately, most of the buildings on the property have been re-built over the years. Like this 5 story pagoda, it houses some relics of the Buddha. 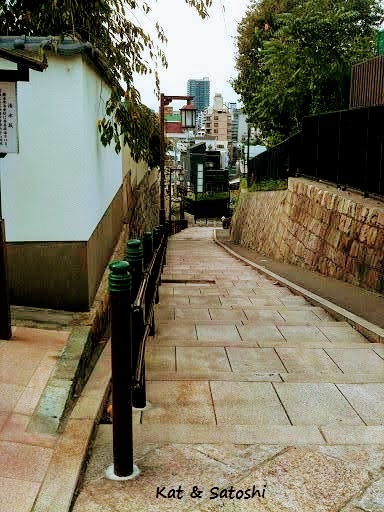 There was also a building in the same area called the Kondo that had beautiful hand painted frescoes of the Buddha's life by artist Nakamura Gakuryo. In this area there are also many slopes, leading to and from temples and shrines, as well as from homes and schools. It was neat to see these, especially since most cars are not allowed in these areas. I dragged Satoshi many blocks to an area I often walk called Momodani. There was a tonkatsu place called Tawara that was featured on a local news show that I thought Satoshi would like. It was crowded, there was a line out the door! After waiting about 10 minutes, we were seated. 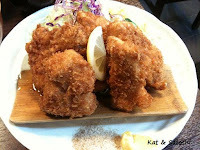 Satoshi had their special ro-su (pork loin)...1300 yen. While I chose their bite-sized tonkatsu...1100 yen. Besides the main dish, you are also allowed one time through the salad buffet. Boy, did Satoshi load up his tiny plate! Lunch also comes with rice and miso soup too. So filling, but the tonkatsu was so tender and moist. After eating so much, we decided to walk back to Umeda. It's about 3 miles from where we were, but a good walk. 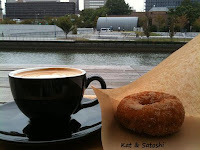 We also stopped in for coffee and shared this doughnut at Brooklyn Roasting Company. Satoshi enjoyed the view from their terrace. 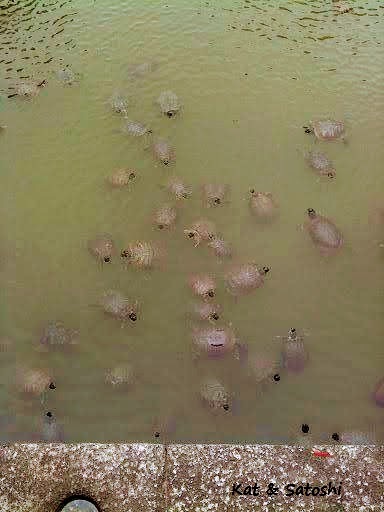 It was an overcast day, but I think we saw a lot and definitely ate a lot. First off, disliking...It had been some time since I bought unsalted butter. Whoa?! the brand of butter I've been buying has cut back...it used to be 200 grams, but now they only come in 150 grams. The sad part is that the price is about the same as when it was 200 grams...eep! 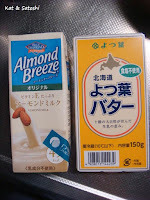 On to liking...found almond milk! Granted it is only in these teeny 200 mililiter boxes (about a cup), and they don't have unsweetened, but I am happy that the food scene is changing in Japan. 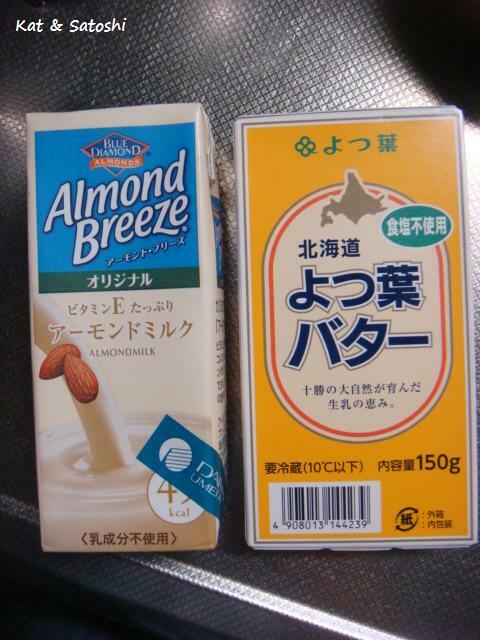 Oh, the almond milk also comes in chocolate, coffee and tea flavors too, I picked up original (plain). What are you liking (disliking) these days? While I was in Hawaii, I came across this...Earth Balance's coconut & peanut spread. It is a little sweet from the agave, there is a hint of coconut from the coconut oil and since I bought "crunchy"...lots of peanuts. You need to take it out of the refrigerator to get soft before using, but I really like this. Is there anything you are enjoying at the moment? Saturday, Satoshi and I went to Aramaki Rose Park to have breakfast. 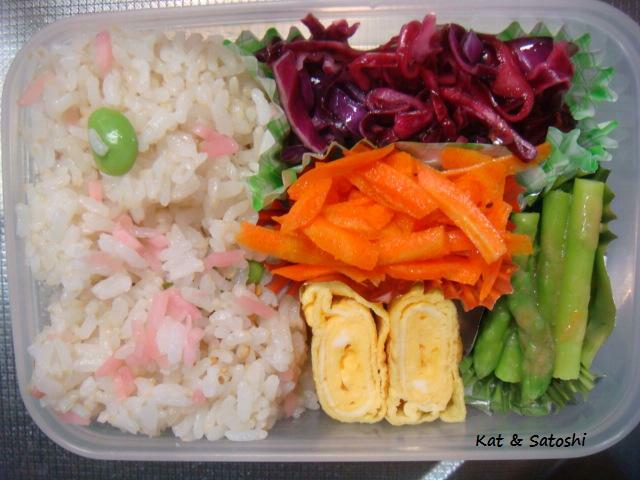 Our breakfast bento consisted of tamagoyaki (rolled omlette), japanese cole slaw, ninjin shirishiri, asparagus with orange miso sesame dressing & rice with edamame and pickled ginger. We also had yogurt with dried cherries and fig jam, basler lackerli, a swiss cookie that is similar to gingerbread, and also some Rusty's Hawaiian 100% Ka'u coffee. It was my first time trying this coffee from the Big Island, it was quite pricey. $36 for 8 ounces. I prefer french roast (dark roast) but they were only selling medium roast at the DFS in the airport. 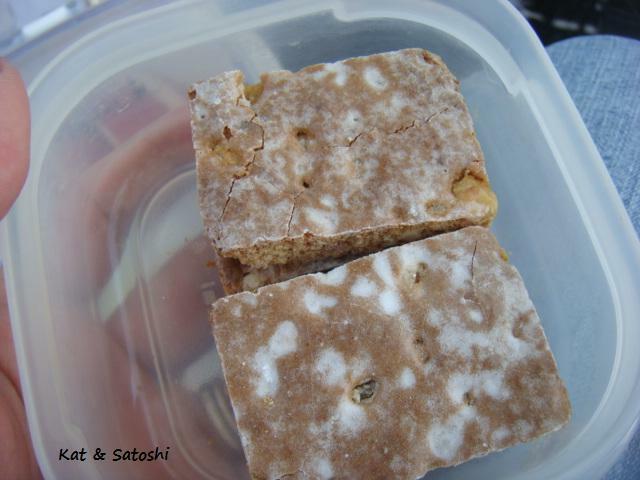 It has quite a bit of acid and there were hints of caramel and nuts. I'm glad I tried this, maybe next time I'll be able to try their dark roast. Not wanting to go straight home, we headed to Minoo for lunch. 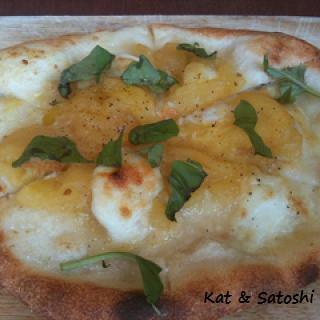 I had the yellow tomato margherita pizza at Per Caffe Bianco. It also came with a salmon salad and of course I had their cappuccino too. Satoshi had their pumpkin soup, a tomato pasta topped with lots of leeks and fish and to end, some coffee. Sunday, Satoshi had his German language class, so we headed to Umeda. I did some shopping while I waited for him. 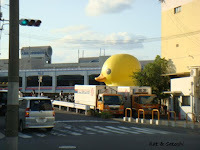 And after a light lunch at Dashi-chazuka-ya (I had their maguro chazuke, Satoshi had their scallop and shrimp chazuke, both came with some araimo (dasheen) and tofu), we went to check out the big Rubber Duck. The place where it was docked had changed since the last time we saw it, but after asking around, we finally found it. Monday, we went to see this film, "Les Saveurs du Palais", about a woman who is asked to cook for the President of France. I thought it was a good film but would've wanted to see more close-ups of food. All in all a great weekend filled with food and good weather. We have a typhoon approaching in the next day or so, stay safe everyone! 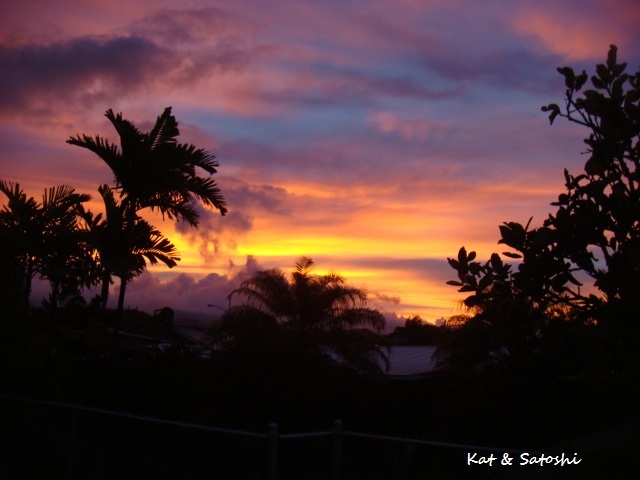 The day I came back from Hawaii, I was unpacking and getting ready to get some sleep when Satoshi says, "Kat, I tried to make rice..."
"There was a little more than 2 cups so I dumped it all in, but when it finished cooking it was super dry"
"So, I added more water and cooked it again"
I told Satoshi, "I'll try to make ohagi from it"
He said, "you can do that?" Well, the picture above is what I tried making...mini ohagi. I rolled a little scoop of rice into a ball then molded some sweet bean paste around it. 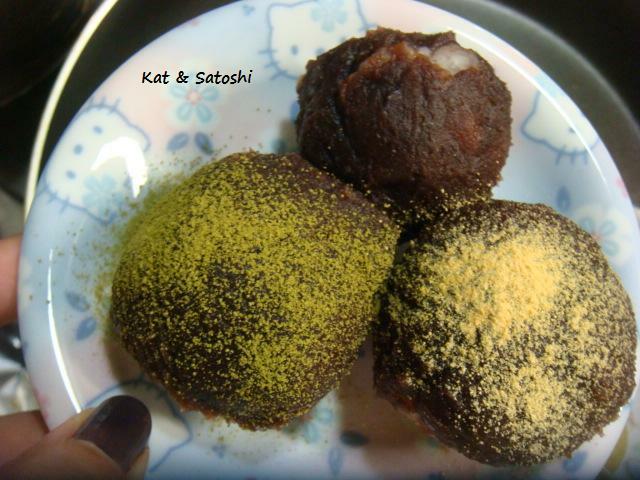 I also dusted some with green tea, some with kinako (powdered soy bean) and some were just as is. He was impressed, I still have more "junk rice" but at least I know it can be salvaged. 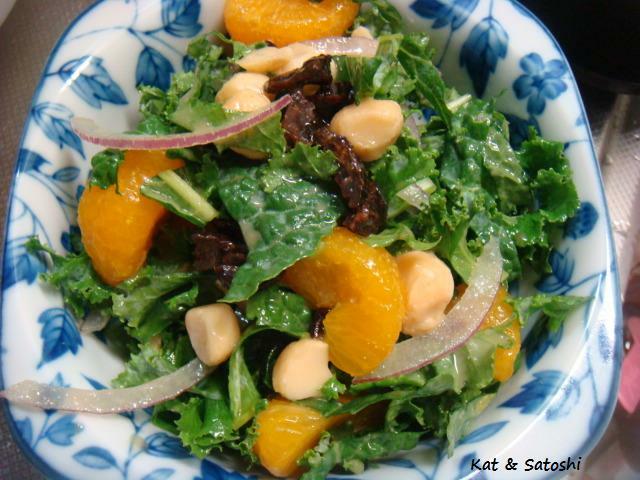 Remember that kale salad we had at the Monkeypod Kitchen? I think I came pretty close to re-creating it. 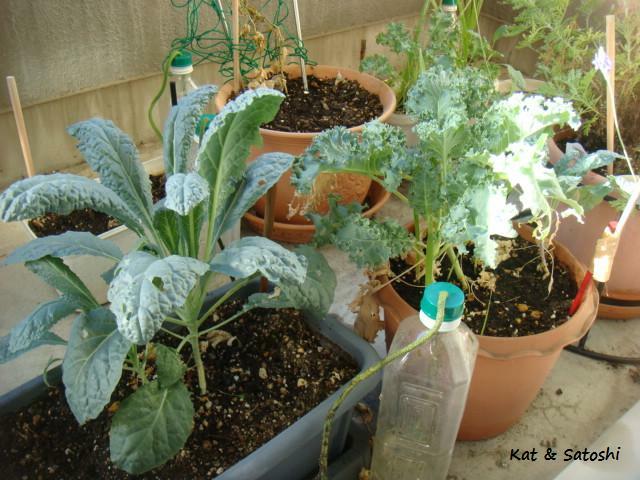 I picked most of the kale on my lanai and julienned it. NOTES: *my vinegar had honey already added to it, if you are using straight apple cider vinegar, you may want to sweeten your dressing up with 2-3 teaspoons agave. After putting a couple handfuls of the kale in a bowl, I drizzled a tablespoon of the dressing and I tossed everything. For toppings, I added some mandarin oranges, thinly sliced red onion, roasted macadamia nuts and dried cherries. I liked this there was sweet-sour, crunch from the nuts...I hope to make this again. Made it back safely. TSA opened my suitcase but didn't really touch anything...whew! Thought my bottle of crunchy biscoff was doomed, but it was neatly wrapped. The flight was kinda empty, my row was too so I got to use all three seats...whoo! 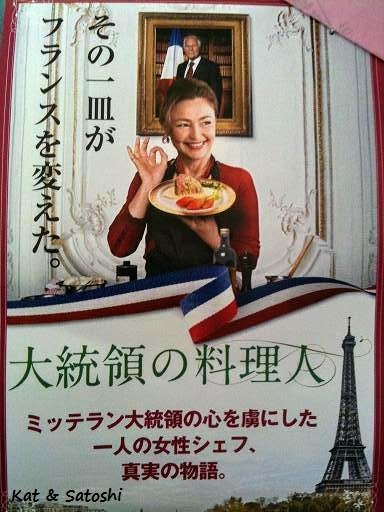 I watched "Une Estonienne a Paris", "Monsters University" & "Kiseki no Ringo". The last movie was based on a true story of how an apple farmer grew organic apples in Japan. And for the snack before landing was a blueberry scone (hard.as.rock. 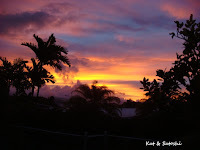 ), fruits & some Big Island Candies cookies. Amazingly, the flight got in an hour ahead of schedule. On my lanai, only the kale is surviving. Can't wait to cook with it. The goya plant got bigger but no goya to be found...boo! Well, it's a 3-day weekend here, I need to re-stock some groceries and clean up around here. If you have a chance to get your "stuff" in order, do so. And if you can put your name on your parent's bill statements and such, do so (most places won't talk to you unless you are on their statements or listed as a beneficiary of sorts). I must admit it took some time calling around and getting things sent in, but I'm glad I was able to get through it. 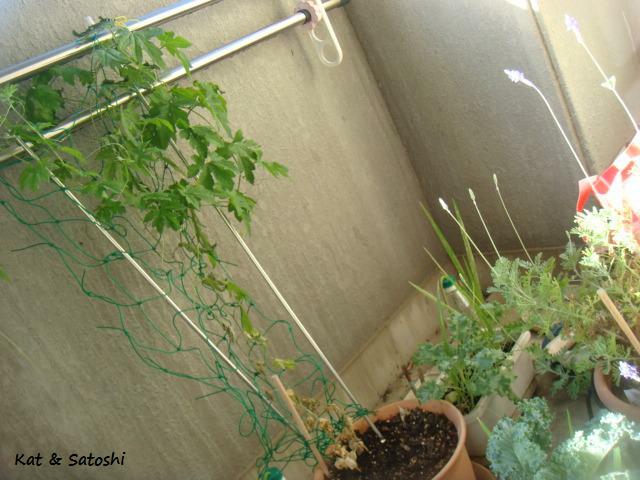 I am a bit worn for wear and am looking forward to getting back into my kitchen, spending some time with Satoshi, finding out what happened to my plants on the lanai...maybe even catching part of Autumn too. I'm headed back to Japan today.